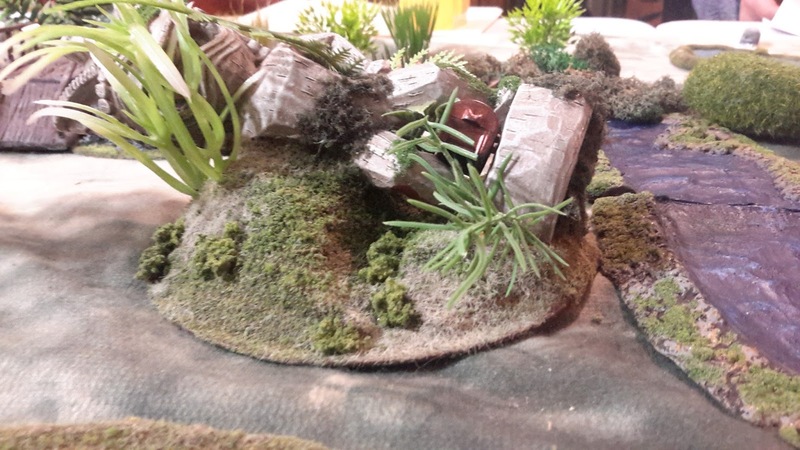 Ghost Archipelago Campaign – The First Outing | H.A.W.K.S. A few weeks back we played our first 2018 campaign game of Ghost Archipelago. Five of our regular group were able play. Since this was the initial game, the scenario was a straight up treasure grab. We placed treasures and then drew for starting positions. 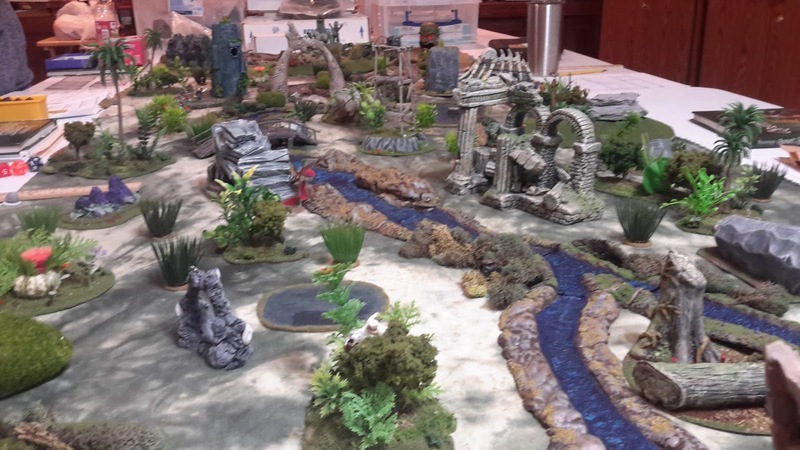 Additional information about the set-up and another game report can be found here: Ghost Archipelago Campaign ‘18, Game 1. Skorri Drakenberg observes the ocean swells as his ship gracefully sails towards a distant island. Could it be true? Have the islands of the Ghost Archipelago returned? Or is this just another wild goose chase? The Lost Isles have been the topic of speculation for many years. False sighting arise every 10 years of so, sending adventurers, freebooters, fortune hunters and heritors sailing the ocean in hope of finding riches and the infamous Crystal Pool. While he would prefer to be standing on the deck of a graceful longship, the dhow that he currently commands would suffice for now. The oriental crew was efficient and most importantly, loyal. He had managed to recruit some additional help in the form of two elven bowmen (Amras and Amrod), an elf who claimed he was an excellent swimmer and diver (Tiefer), and a hunter/tracker (Kukala) who said he was familiar with the wildlife typically found inhabiting the islands of the southern ocean. As luck would have it, he had also picked up a spell caster. The young warden who calls herself Anemone and swore she could manipulate the waves and call forth wild beasts. All untested claims. No doubt she’ll probably end up fertilizing some desolate island jungle. 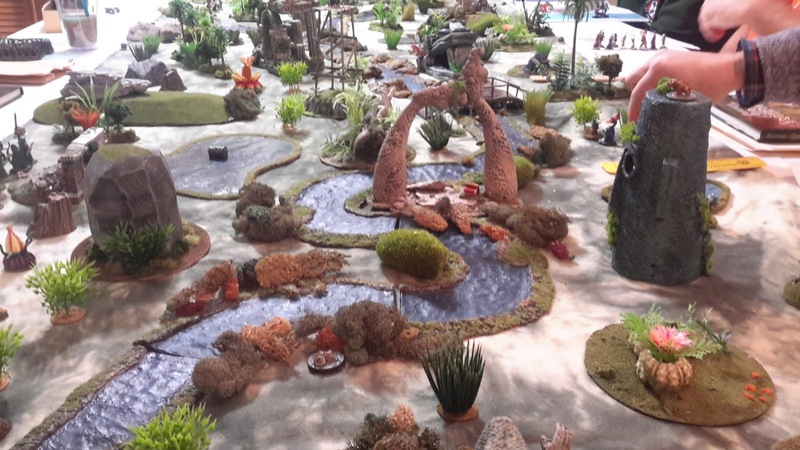 However, she was down on her luck and appeared to sincerely want to assist with his quest – and he had a soft spot for damsels in distress of any kind. Only time would tell if he had made a good decision. It is said the crystal Pool can not be found without first finding and deciphering 10 map stones. There is a rumor that such a map stone might be located on Tikki Isle beneath one of the many statues dotting the jungle that has sent Skorri on this trip. The ship’s master anchored just offshore. A couple other ship’s masts could be seen in the distance. Other adventurers, and probably other heritors, would be searching the island. Skorri quickly got his crew into the row boats and headed to the sandy shore. Skorri and his crew moved forward through the jungle. In the distance he spots a toppled statue of a tikki warrior. Hopefully the rumors about location of the map stones was true. Skorri moved forward with the two bowmen. 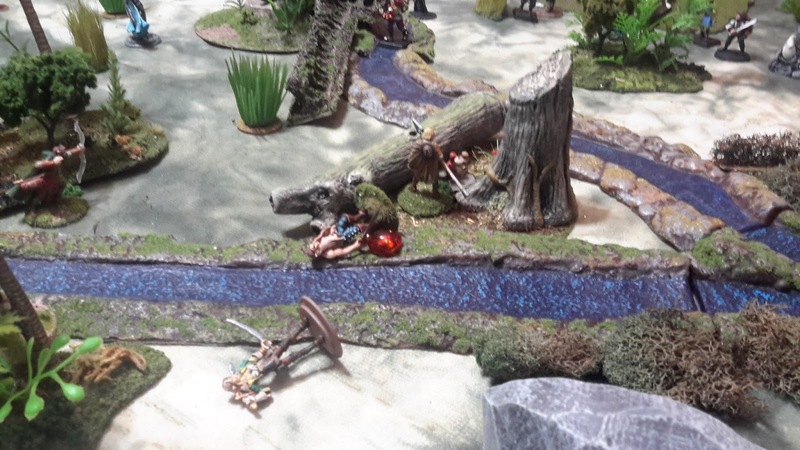 Through the foliage and trees, he saw that another crew was moving around across a small river, and heading towards the same statue. It appeared that at least one other was investigating the same rumor as himself. Blue Boy moved toward an old lookout tower. He thought he could see something concealed on the upper platform. Anemone (Wave Warden) spotted a duckman moving through the brush near a small river. She quickly spoke the words to have the river smite the creature. The water from the river rose up in the shape of a fist and swung towards the duckman but broke apart as it struck. The duckman got wet but did not suffer any damage (successfully cast Wrath of the Waves). Anemone struck a nearby tree in frustration. She wanted to prove her worth to Skorri. 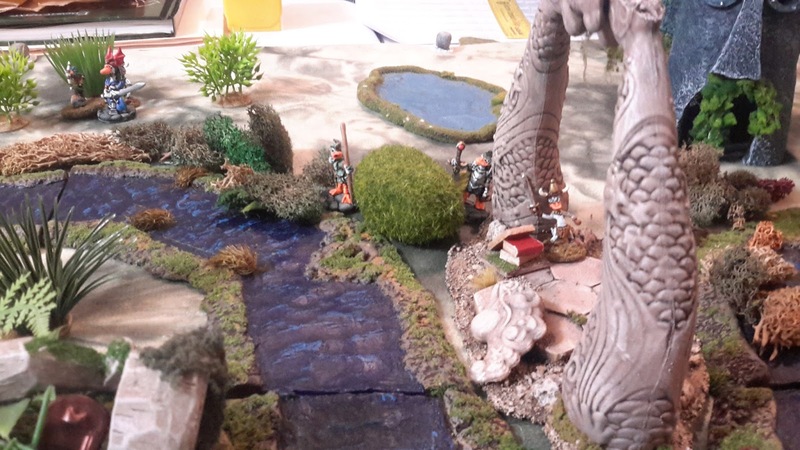 The duckmen moved closer to the river’s edge, heading towards the fallen statue. Skorri closed his eyes and he called forth one of his abilities. He could feel the energy surge through his body; along with the usual twinge of pain. He quickly moved forward in a blur and snatched the chest from under the feet of a fallen statue (Successfully triggered Surge to move twice and pick up the treasure). He then quickly ducked as an arrow came flying his way. 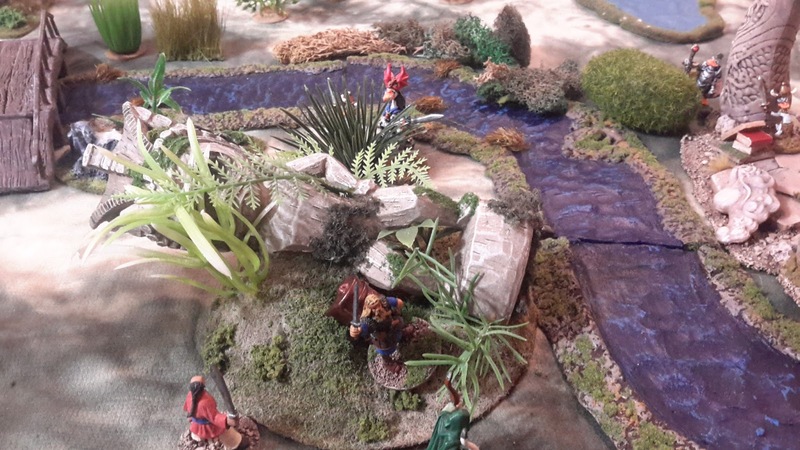 The two bowmen (Amras and Amrod) accompanying Skorri fired arrows at the duck heritor across the river but the dense vegetation caused the shots to miss. Or maybe he “ducked”. Tiefer (Pearl Diver) had moved up to the edge of the river and crouched behind some bushes to observe the duckmen’s movements. Suddenly, the bushes uprooted themselves and slowly inched away from him. Before he could move, Tiefer found himself struck in the shoulder with an arrow (9 points of damage). 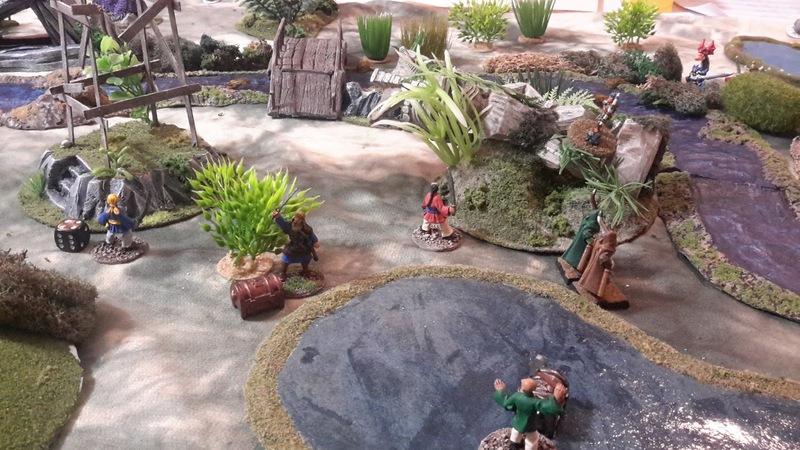 Wu (Crewman) moved up crossed the river to challenge the duckmen for a pile of treasure hidden in the bushes. Wu is quickly set upon by the duckman and is quickly taken down. The duckman grabs the treasure. Anemone decided to try a different spell this time. She spotted Hat Chet at the edge of a deep pool of water. He was pointing at something at the bottom. Anemone thought he would benefit from being able to breath underwater so she quickly prepared her Amphipibious spell. In her haste, she jumbled the words and the spell failed. She was worried because Hat Chet dove into the pool anyway. He swam down and grabbed a chest. Kukala had moved forward and spotted movement through the brush. He notched an arrow, aimed, and let it fly. The arrow struck a duckman but didn’t take it out action. He then noticed Tiefer take another arrow and drop into the vegetation. Kukala didn’t see him get back up. The sky was starting to darken, unusual for the time of day. There must be some sorcery at play. The weather would reduce visibility making it harder to spot targets but would also provide cover from arrows. Skorri found himself swarmed by duckmen. Skorri used Surge and easily dispatched one of the duckmen. The other duckman wisely chose to withdraw. 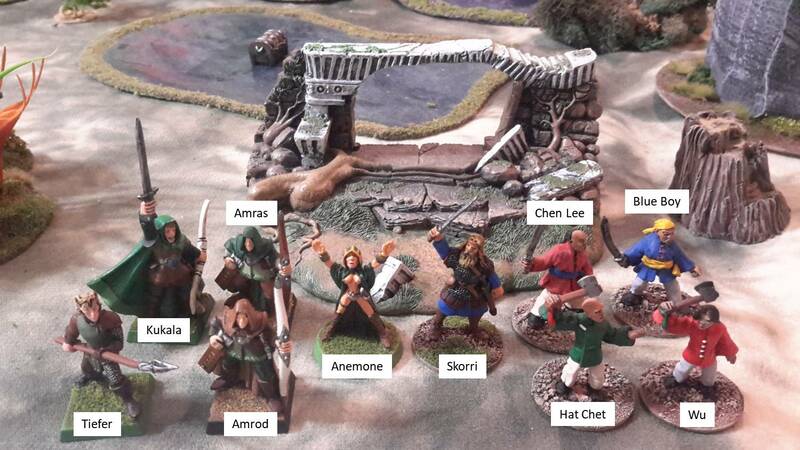 He was covered by a duck bowman who took a shot at Skorri, barely nicking him (1 point of damage). Anenome cast Amphibious on Hat Chet. It was just in time as carrying the treasure would have made for a harder swim check. With the amphibious ability, Hat Chet easily made it out of the deep pool and moved into cover. Kukala takes careful aim at the Duck Warden peering out from some palm fronds. The arrow flew straight and impacted with a cloud of feathers (5 points of damage). That made him duck (pun intended). Blue Boy finally made it to the top of the lookout tower. The item he spotted did appear to be a treasure so he quickly picked it up. While up top he had a good view of the jungle area, even though it was somewhat hampered by the incoming clouds. Off in the distance he could hear the sounds of swords hitting swords. Someone was having a hard fight. Though blurry, he could just make out the combatants. 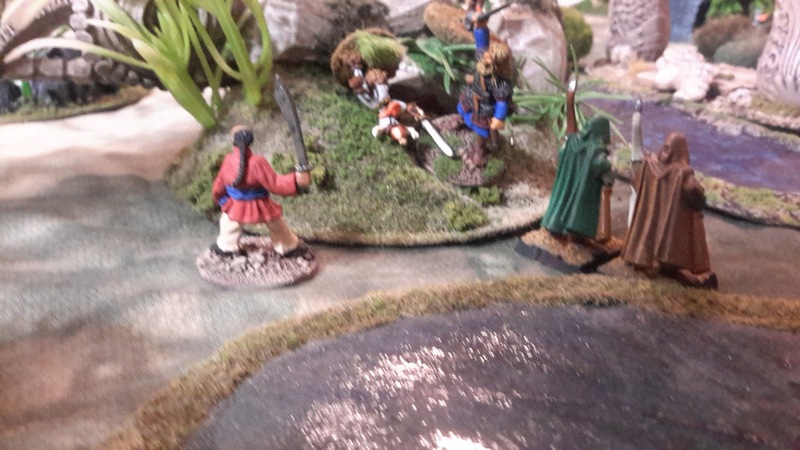 Covering Skorri’s withdrawal, Amrod fires an arrow at a duckman bowman. He doesn’t cause any damage but the duckman does decide to move back. The cloud cover thickens again, greatly reducing line of sight (visibility is reduced to 12 inches). This was helpful if you were trying to get away with some treasure but at the same time, hindered your ability to stop other crews from doing the same. 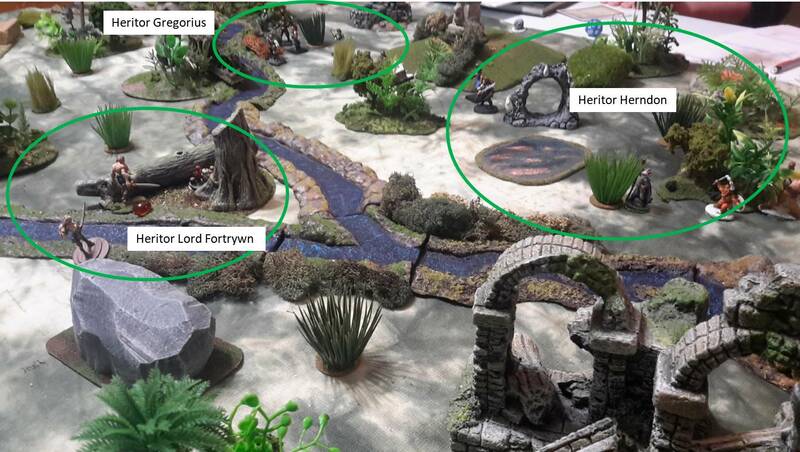 Skorri slowly withdraws, moving from cover to cover to avoid the duck bowmen. It doesn’t take long before he is beyond their line of sight. The duckmen that took out Wu was attempting to make off with a treasure. Anemone cast Wrath of Water but only by straining so hard that blood oozed from her ears (pushed the spell for 5 points of damage). Unfortunately that was the only damage the spell caused as the duckman was not harmed (water off a duck’s back and all that stuff….). Over at the old lookout tower, Blue Boy dropped the treasure to Chen Lee and began to climb down. Chen Lee picked it up and began to fall back. Once he had climbed down, Blue Boy followed him. Anemone cast Wrath of Water on the duckman with the treasure once more. This time the water hits him hard (caused 8 points of damage) but he remained standing, and holding the treasure. Kukala took aim and shot an arrow towards the treasure carrying duckman. Once again, the heavy jungle vegetation deflected his shot. Seeing that his crew had collected three treasures, Skorri calls for them to withdraw. Anemone pauses to cast Wrath of Water one last time. With the sky being so overcast, she could just barely make out her target dashing through the trees. She called forth to the river to reach out and smite the duckman but the fumbled her casting. Kukala pauses beside Anemone to take a final shoot. The reduced visibility and the vegetation once again causes his shot to fly wide of his target. With a sigh, Kukala watches as the duckman, and the treasure, fades out sight. Disappointed in himself, he slowly turns to head towards the beach. As the crew is withdrawing, Anemone manages to cast Amphibious on two more of the crew just in case it is needed. All things considered, Skorri was extremely pleased with the performance of his crew. 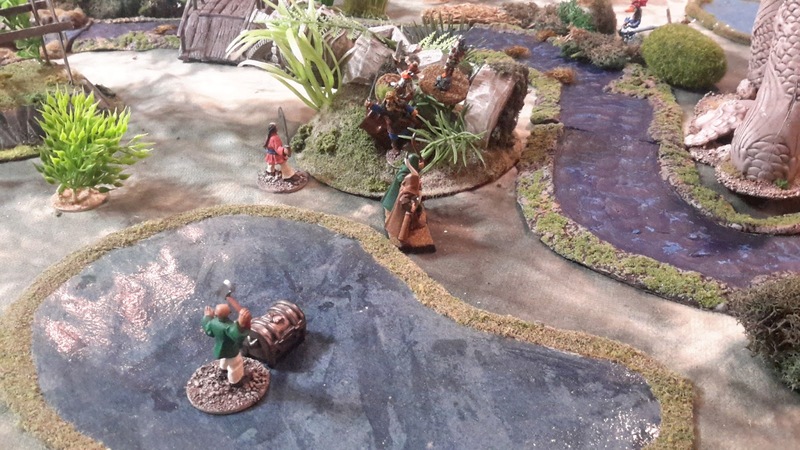 Sure the bowmen could have hit more targets and Anemone could have had better luck with her casting – but he did end up securing three treasures. Back aboard his ship, Skorri examines the day’s take. The treasure chest he had found under the idol did indeed contain a map stone – just nine more to collect. Chen Lee’s treasure contained 10 gold coins and a sword that glowed with magic energy (Magic hand weapon +1 Fight which Skorri claimed for himself). Hat Chet’s treasure contained 10 gold coins and a potion – Water of Life. 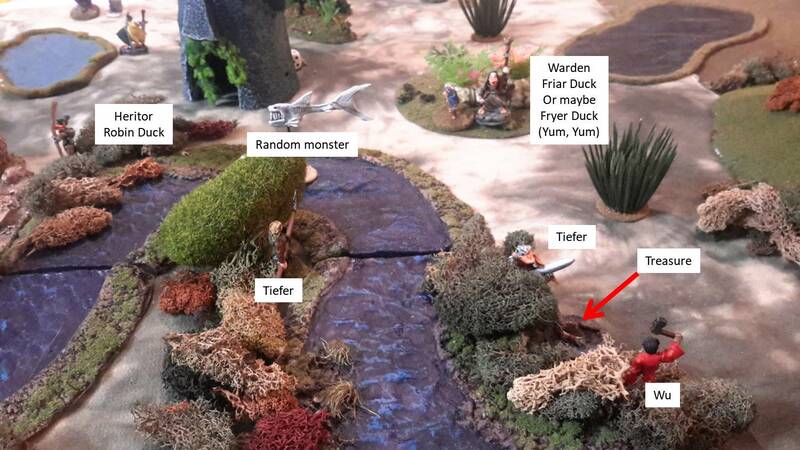 Fortunately for Skorri, Tiefer recovers with no negative effects. With only 20 gold, it’ll take a while to amass the necessary payment to head back to port to recruit another specialist. Crewman Wu also managed to recover. Skorri garnered 185 experience points while Anemone managed to gain 120. A great first game. 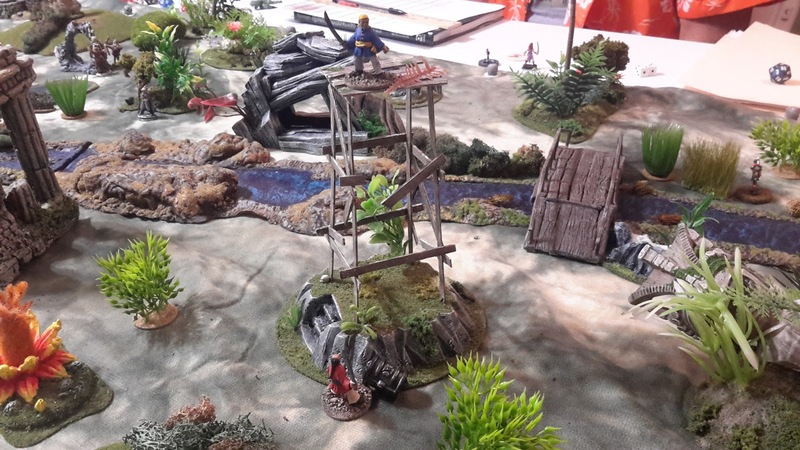 Ghost Archipelago plays much differently then Frostgrave. It seems to have a much more combat focus – both melee and ranged. Only time will tell if this is really true.